These fun, Just Print pages, are perfect to start your mornings! They are consistent, spiral, and cover several common core standards. The top of each page has a "My News" section for students to tell you what's going on in their lives! Practice of addition, subtraction, multiplication, patterns, graphs, rounding numbers to nearest ten and hundred, simple past tense, simple future tense, suffixes, and verbs. BONUS: At the bottom of each page there is a writing activity for early finishers! 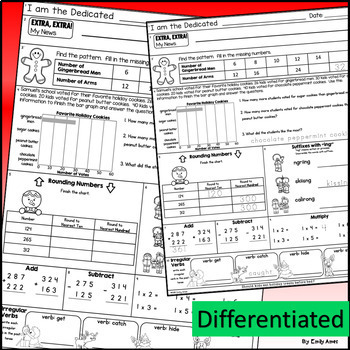 The differentiation and consistent format of these pages encourages independence. After directly teaching the layout and standards for a few days, students should be able to complete the pages independently, leaving you free to take attendance and complete morning tasks. I'm working on Third Grade morning work packets for the entire year! Each new packet will be available the 15th of the month before you will use it. i.e. The January Packet will be available December 15th. 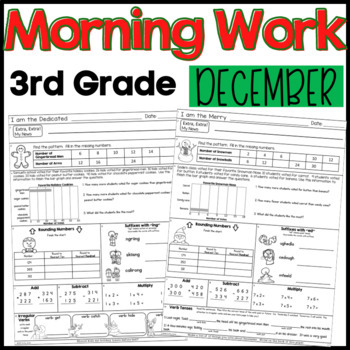 Get the Third Grade Morning Work Growing Bundle early before the price increases! Follow me for updates on my store! Look for the green star next to my store logo and click it to become a follower.